2017 Sees a new look for the tired Old BMW. Same bike but new look thanks to John Kimble Graphic Design, Chili Graphics and Chandlers BMW Portslade. The journeys and travel continue across the UK and out into Eastern Europe as requests and support is given by the charity. Primarily though it is thanks to companies such as these in keeping the wheels turning that make it all happen. Thank you and well done. 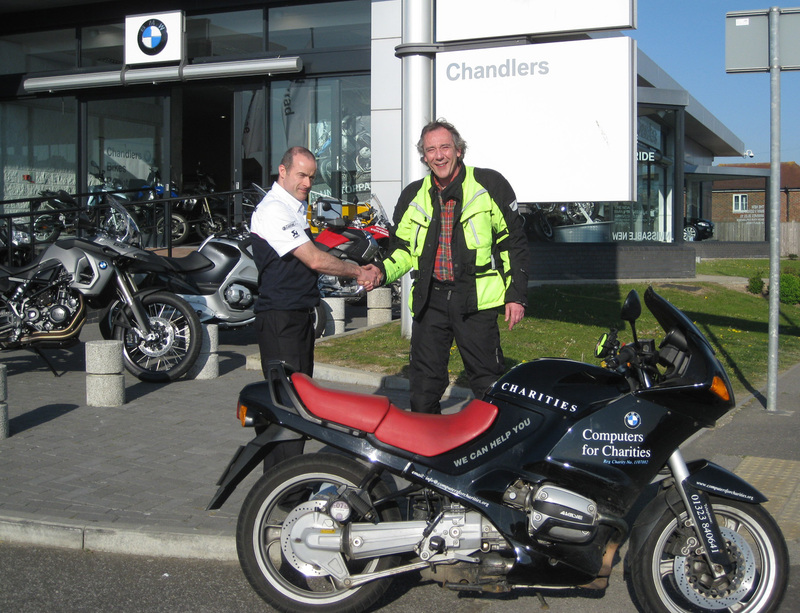 2010 saw the launch of the charities BMW motorcycle project.The project came together following the unexpected and anonymous donation of a 1995 BMW R1100RS tourer at the charity’s Sussex base. Apart from the fact that the charities chairman had not ridden a motorcyle in over 20 years, few people were aware of his preference for BMW’s. The donation has enabled Simon Rooksby, founder and Chairman of Computers for Charities to visit wide ranging organisations and projects seeking to benefit from the charity’s support. Not just across the UK but further afield covering much of Western and Eastern Europe. Other partners that have made the trip possible include BMW and Motorrad, providing panniers and clothing plus Brighton based BMW Chandlers, a local dealership who service the bike to ensure it’s roadworthiness for the extensive journeys it undertakes. The inagural trip in May 2010 involved a 5,500 motorcycle tour taking him to parts of Southern, Eastern and mainland Europe. The long ride through parts of Eastern and Southern Europe required an early start from Hailsham at 6 am on the Thursday morning. Simon crossed to Calais at 7am and then drive more than 700 miles to reach Milan for an overnight stop. Simon then headed to Ancona to cross the Adriatic Sea by ferry to arrive in Albania. Visiting a children’s project in Lezhe providing technical support and equipment updates. Then on to visit the School of Light for two days, a project for blind children that he personally helped to set up in 2008. Back to the ferry and returning to Italy it was a 300 mile drive to Turin. Meeting local groups seeking support from Computers for Charities . The final leg of the tour involved riding across to France and Cannes for an overnight stop, then straight on to Almeiria in Spain again to meet local community groups seeking to develop educational programmes to aid development of local communities. Just 2 days in Almeiria and then onto to Bilbao to get the ferry back to Portsmouth. And on it goes. Sadly the last year has seen the bike regularly off the road for ongoing major repairs permitting only limited opportunities for outreach. However we hope that matters will shortly be rectified and visits restored thanks to support from Chandlers BMW Brighton. Way to go Simon! That is the spirit of adventure in action. You rock Brother! Looking forward to your updates. Be blest and drive safely. r?